A convenient hole for the face let's you see where you're going! Cacti have adapted to live in the driest climates on earth. Incredible! But don't think that just because they're surrounded by desert sand and not a whole lot going on that they're boring. No, no. Cacti are some of the funniest, coolest, most chill, enviable plants on Earth (the Rat Pack of plants, you might say)! They love telling jokes, in fact, they'll "poke" and "prod" anyone to get a laugh out of them, and if they push hard enough, they'll even settle for a scream. They're excellent bartenders, always have water on hand for a fine mixed drink (just don't ask for it on the rocks). Yeah, cacti are pretty cool, and believe it or not, they're the life of any party. 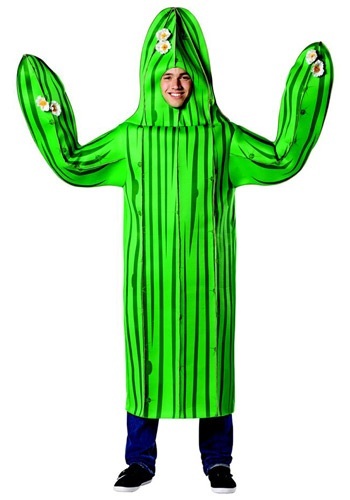 Now it's your turn to give the unique spiny species a good name with this adult cactus costume!